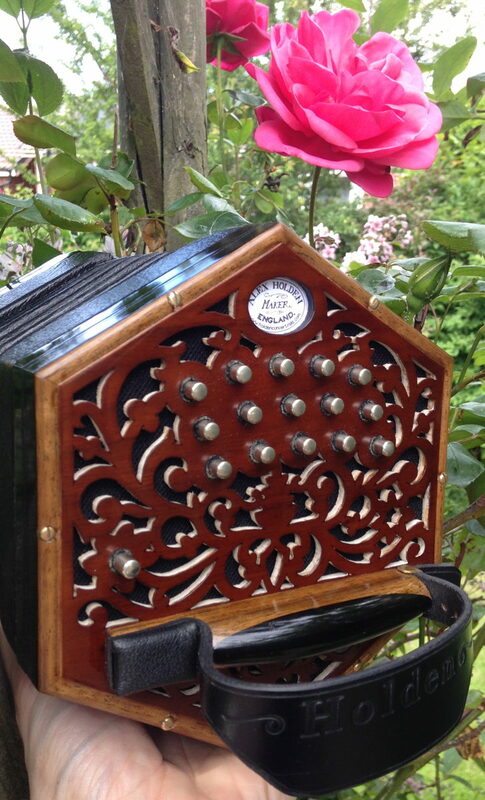 A few weeks ago I completed my second new concertina. For pragmatic reasons I chose to build an example of what is probably the most popular type of concertina sold today: the 30 button 1 C/G Anglo in a 6 ¼” hexagonal frame. 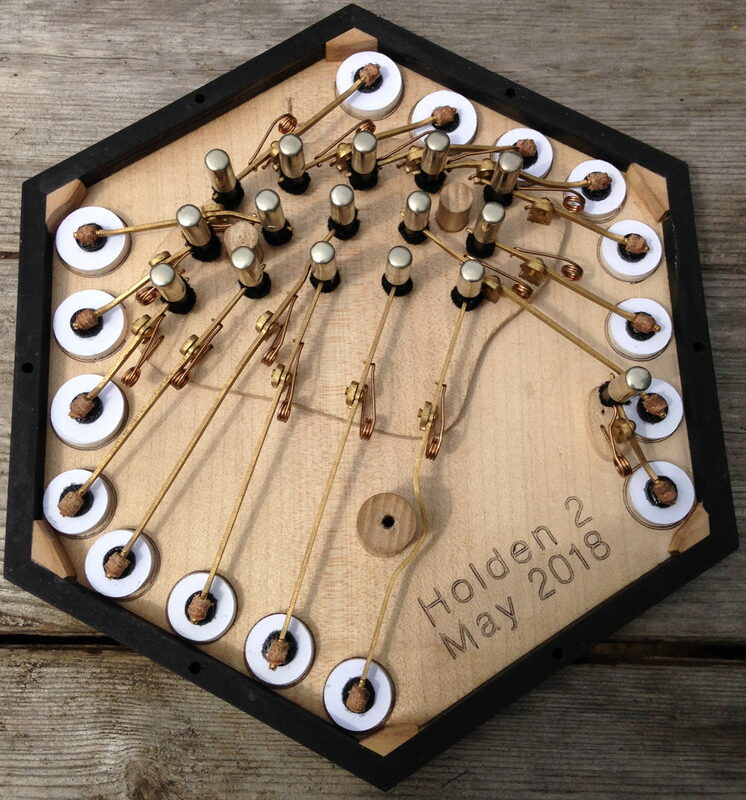 I decided to name this model (and variations on it) the Holden Blackbird in honour of the small family of blackbirds that sing and dance on the roof of my workshop while I am building instruments (no photos of the birds, unfortunately: they are very camera-shy). 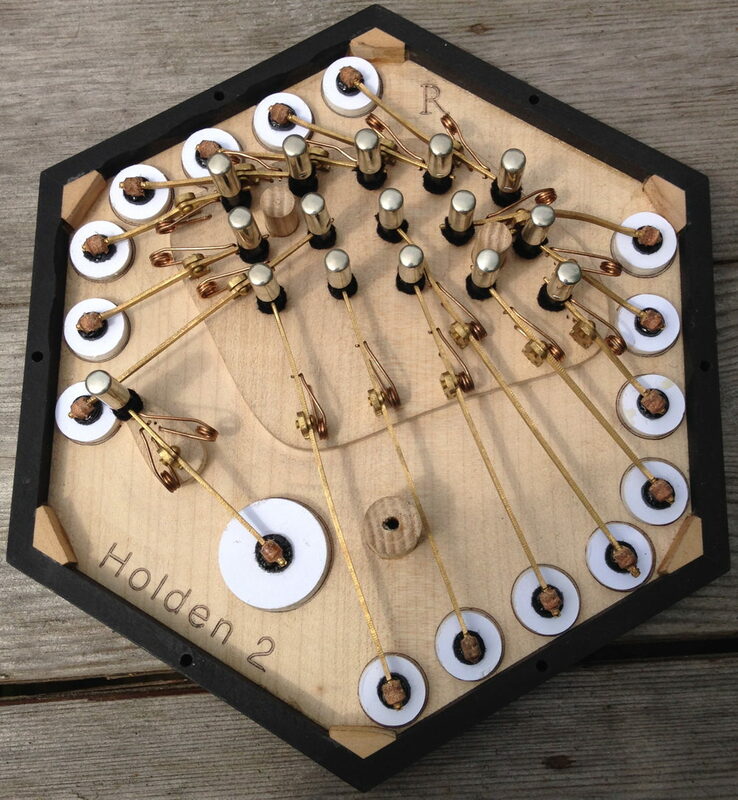 31 buttons + air (Wheatstone layout with a middle C drone on the left thumb button). 6 ¼” (159mm) wide hexagonal frames. All parts other than various screws made by myself in England from high quality materials, either by hand or on my little CNC milling machine (everything visible on the outside of the instrument is hand made). 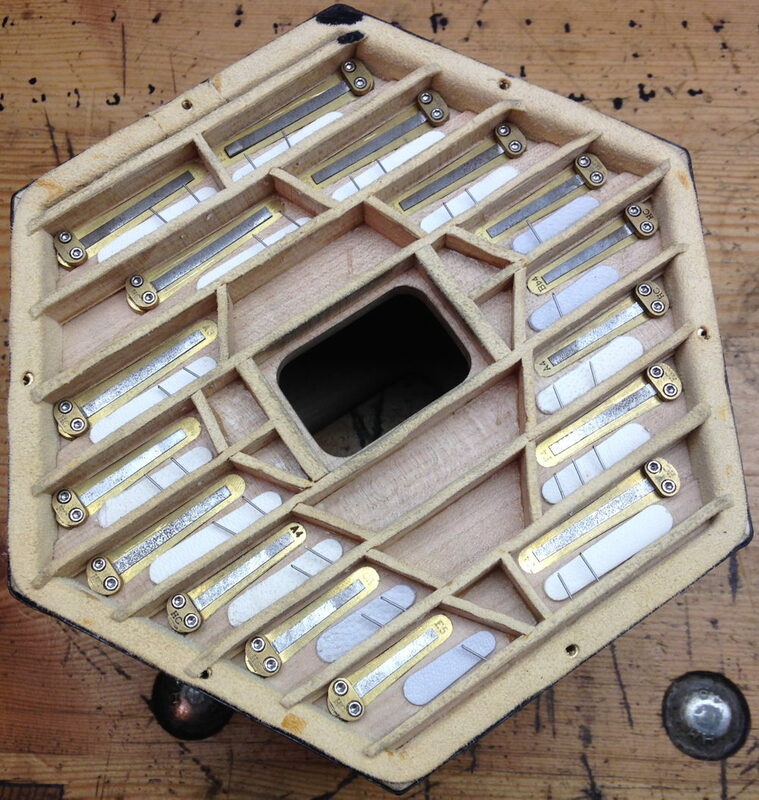 Traditional long-scale concertina reeds, with hand-filed spring steel tongues closely fitted under a microscope into brass frames. They are loud and responsive with good dynamic range and pitch stability. I don’t like trying to describe tone in words because it is so subjective, but I’d say it has a strong sound without being overly harsh. One player called it, “sort of Jeffries-ish.” I recommend hearing it in person if you can – the iPhone recordings don’t really do it justice. 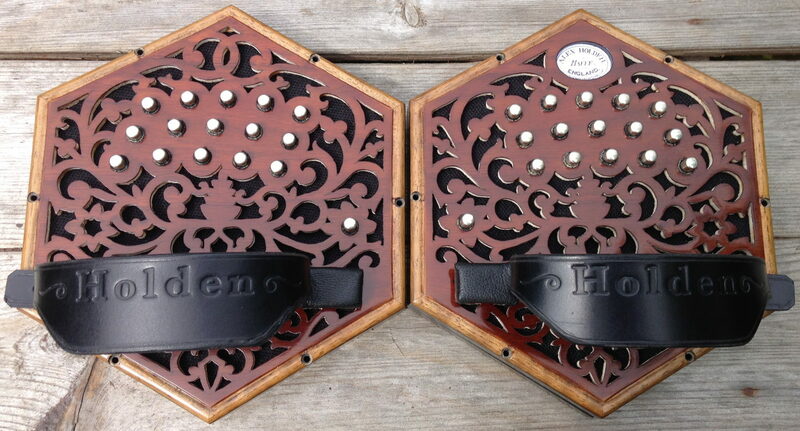 Seven fold black goatskin bellows with black leather-effect papers. They are supple and don’t have a tendency to spring open, due to building them freehand without a mould. Black Ebano (a sustainable alternative to ebony) action box walls. Laminated hardwood end boards (for strength and stability) with American walnut face veneer and a moulded English walnut border. I used different shades of shellac for the central part and the border. Hand pierced fretwork to my own traditional-style design inspired by Victorian patterns. 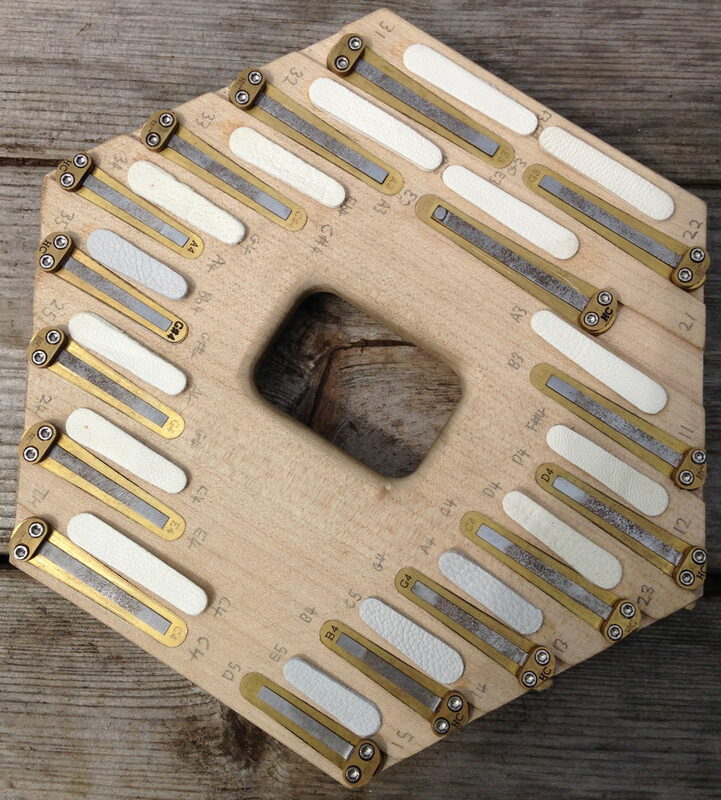 Sycamore reed pans (rotated parallel-chamber arrangement with variable chamber depths). Spruce bellows frames with splined corners (for lightness and strength). Curved rippled English walnut and Ebano hand rails with leather-cushioned thumb pad. 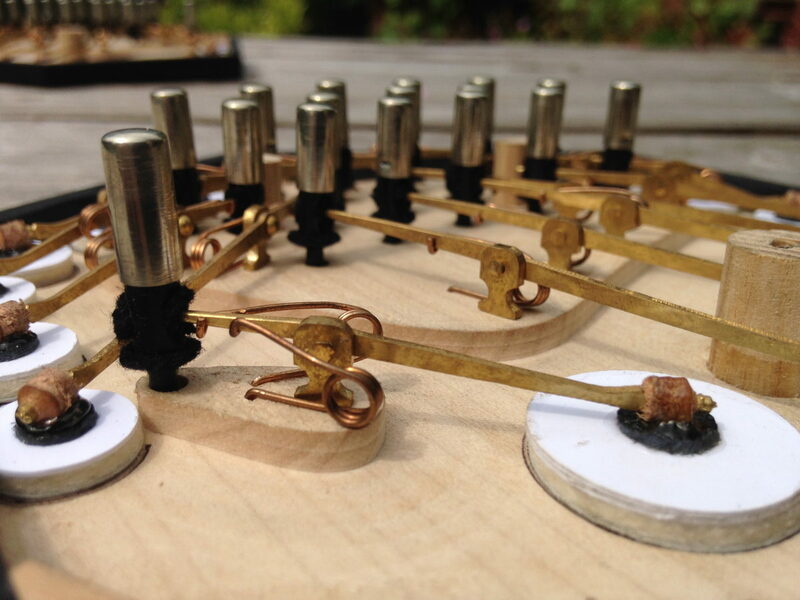 The strap clamp screws go into threaded brass inserts (rather than directly into wood as on many vintage instruments). Heavy duty black leather hand straps with rounded edges and skived back. All exterior woodwork painstakingly French-polished by hand. Comfortable 5.7mm diameter buttons with nickel-silver caps over acetal cores. Thumb buttons are slightly taller than the finger buttons for ergonomic reasons. Light (about 65g), fast, riveted brass action with phosphor bronze springs. Traditional slotted brass end bolts with heads mostly recessed into the frame so they don’t dig into your hands or catch on the lining of the case. 21mm diameter air button hole for fast breathing. Black mesh fabric behind the fretwork to help keep the interior clean. Unfortunately I didn’t get a recording at this session, but I think the player’s expression speaks for itself. Members of the American Travelling Morrice giving the instrument a test drive. Photo by Will Quale. Curved hand rails with heavy duty straps and padded thumb rests. My own unique fretwork pattern. 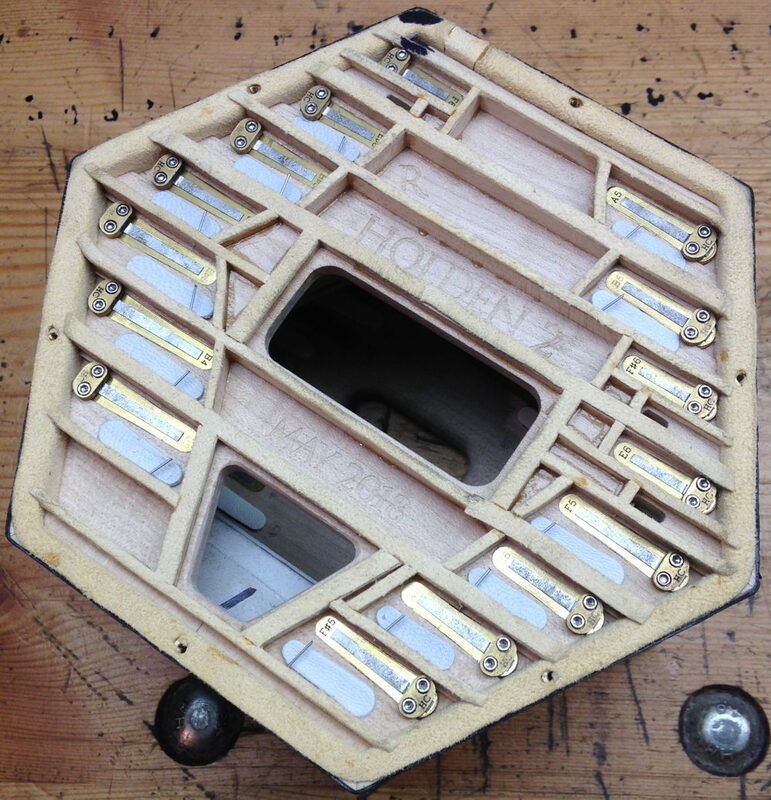 Individually machined and hand finished brass action levers. Left reed pan (bottom). The lowest reed is set as far in as possible to improve response. Right reed pan (top). The lower hole is the passage for the air pad. It took me much longer than I had initially anticipated to develop the Blackbird, because after finishing my first instrument I took a fresh look at every part of the design and aspect of the build process and made improvements to virtually every component, re-made many of the special tools and jigs, developed my skills further, experimented with new materials and techniques, and as a result I believe I have succeeded in building a very nice instrument. If you are interested in seeing many more pictures and video clips of the construction process, I urge you to dig back through the posts on my Instagram page. 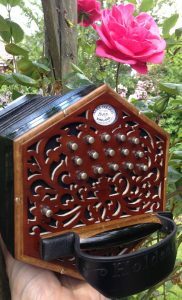 At the time of writing I still have this instrument here in Burnley if you would like to contact me to arrange a visit to try it out. Better be quick though, because I have already had a few offers for it and need to sell it soon for cashflow reasons. 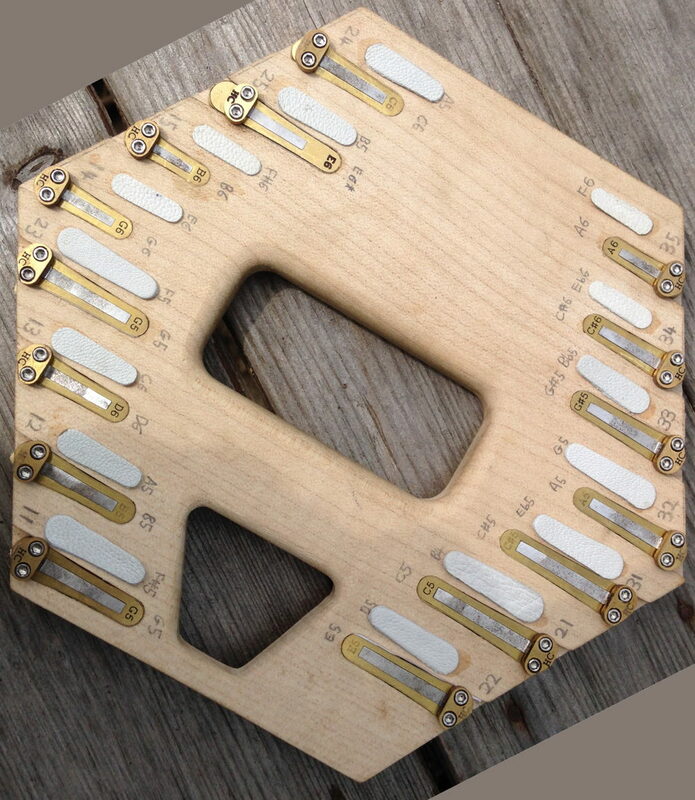 Although this is a wooden-ended C/G, I could easily make one like it with nickel-silver ends or a different wood veneer, or in different keys (e.g. 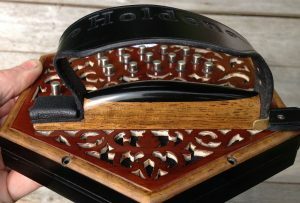 G/D), or with a Jeffries keyboard layout, or different numbers of bellows folds, or different button diameters, or with aluminium reed frames to reduce weight. The drone button is optional, or I could put other notes on it that you would find more useful. I’m happy to discuss the possibility of more significant variations like different numbers of sides, smaller frames, extra buttons, etc. 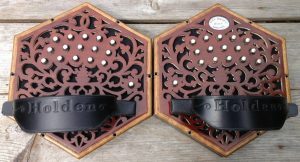 I am also willing to consider building other types of concertina: the next two new instruments in my order book are both Crane duets. At this time I am focused on making bespoke high-quality English-construction instruments with my own traditional reeds. Something important to bear in mind if you are in the market for an instrument is that as a new maker without an established reputation I am currently charging below market rate for an instrument of this quality, in order to build up experience and get my name out there. Right now my waiting list is roughly five months, but once the order book starts filling up I will reevaluate my prices. As with the development of any prototype product, I encountered quite a few ‘unplanned learning opportunities’ along the way: My first two attempts at laminating the end boards warped badly before I managed to make a pair that stayed flat. The French polishing process went wrong several times and I had to repeatedly sand it back and try again before I was finally happy with it. Related to that, the black wool button-hole bushes look dusty as a result of repolishing the ends one final time after I had glued the bushes in. My first attempt at machining an action board went so wrong that I scrapped it and started again. I made a full set of action levers before realising I’d made a mistake in the design and they were all the wrong length. Some of the action springs were really tricky to install because I hadn’t allowed enough space for them. I somehow tuned a reed two semitones higher than the pitch engraved on the frame. I initially made one of the highest reeds an octave lower than it should have been. A mistake with the design of the hand strap clamps means you need a screwdriver to adjust the strap length. The bellows have a few minor cosmetic issues that don’t affect the playability of the instrument (in particular I experimented with a different sort of leather that has a coarse plasticky artificial grain – it works fine but I don’t like how it looks). 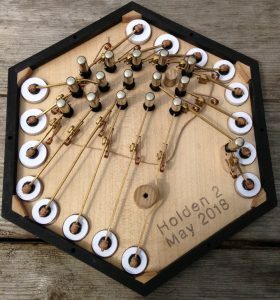 The very highest three or four ‘dog whistle’ notes have a narrower dynamic range than the rest of the instrument (though none of the test players noticed until I pointed it out – I’ve been told most players very rarely use those notes). Probably several other things I’m forgetting right now. All stuff I learned from on this build and will be able to avoid the next time. 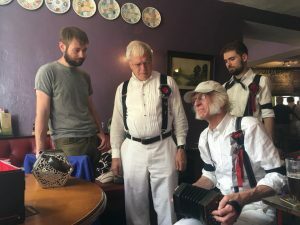 I am grateful to several other concertina makers who offered useful advice and ideas as I was working on this project, including and especially Chris Ghent, Geoff Crabb, Bob Tedrow, Dana Johnson, Jake Middleton-Metcalfe, and Wim Wakker. I also ‘borrowed’ a lot of ideas from studying older instruments made by Crabb, Lachenal, Jeffries, Wheatstone, and Dipper (mostly from online photograph searches, though I’ve learned a great deal from the vintage instruments I have restored).